The first week of 2015 has officially come to a close, which is just the first hump to get past when it comes to achieving your New Year’s resolution. Have you made it so far? If you’ve failed to stay faithful to your plans or you haven’t got a start on your resolution yet, don’t worry; there is still time. If you’re still going strong, keep up the good work! But if you’re still wondering what your goal should be in 2015, well, below are four simple New Year’s resolutions to boost your mental health this year. Maybe you’ve tried the traditional ideas that are plastered all over the magazines, talk shows, and the evening news in the past and they just didn’t work, so you’re done with making resolutions based on these failures. Well, maybe the key is to just think outside the box. This year, it’s time to do something a little different. 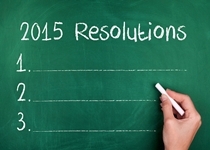 Here are a few out-of-the-box resolutions you might want to consider. Everybody has a routine. You probably wear certain things on certain days or have go-to outfits; maybe you always drive the same way to work; or maybe you get your coffee from a particular place every day. This year, try switching it up a bit. Each week, put a new twist on something you normally do; take a different route to work, wear an outfit you wouldn’t normally wear, or pull those fancy shoes out of the closet and treat yourself to some fine dining. Finding little ways to make life more fun and interesting goes a long way! It’s easy to get depressed this time of year; it’s cold, dark, and the holiday buzz has disappeared. You may have also spent the last month overindulging and now you’re feeling guilty. In fact, depression creeps up a lot this time of year and with resolutions being on everyone’s minds, you may find yourself focusing on your perceived inadequacies and what you “should be” doing. This year, make your resolution to simply be happy with who you are and the life you’ve built to this point. It might not be perfect, but you’ve likely come further than you think. Better yet, each week, sit down with a photo album or old journal to reflect on the past as a reminder of what you’ve achieved and experienced. One of the reasons why so many people fail with New Year’s resolutions is that they become hyper-focused on one particular area and eventually burn out. Instead, look for balance. Look for different ways to enhance your life and try to incorporate them into your daily routine. Drop what doesn’t work and maintain what does! And when I talk about balance, I’m referring to all areas of your life—home, work, play—and both your mental and physical health. In truth, the New Year is little more than a new arrangement of numbers on a calendar. You don’t have to use the New Year’s ball drop as a form of motivation. I believe in letting yourself evolve naturally, finding more meaningful motivators to make the changes you see fit. You won’t succeed if you don’t want to do something, regardless of the year.